On Saturday Intel lifted the embargo on information related to their quad-core Haswell processors, and we’ve been busy posting all sorts of details over the weekend. Today, perhaps earlier than some expected, the embargo on the dual-core Haswell parts lifts as well—at least, the ones that are ready to start shipping. What that means in practice is that we should see a lot of Ultrabooks with dual-core Haswell processors, and perhaps some regular laptops as well. On the desktop side, right now there’s only a single dual-core SKU listed, and it’s a 35W Core i5 (basically just a repackaged mobile part). You can find details on the quad-core desktop and quad-core mobile models in our two previous articles; here, we’ll quickly cover all of the announced dual-core parts. Unlike the desktop side of things, Intel is launching the full suite of dual-core parts for mobile Haswell, including Core i3 models. As usual, the only major difference between the various offerings comes in the form of clock speeds and whether or not Turbo Boost is available; Core i7 and i5 have Turbo Boost and Core i3 doesn’t. The Core i7-4600M along with the i5-4330M and i5-4300M also support vPro/TXT/VT-d, and the i5-4200M and the Core i3 models lack those features. Since the parts are basically the same, I also tossed in the lone dual-core T-series desktop processor as well. Quickly starting with the latter, the i5-4570T in practice looks to be the same as the mobile i7-4600M, except with a slightly lower maximum clock on the GPU and a 35W TDP instead of 37W. Intel does list a price on the 4570T of $192, however, which is probably a great deal compared to the i7-4600M pricing. Of course, the 4570T also uses socket LGA-1150, so you couldn’t actually use one in a standard notebook CPU socket. All of the dual-core M-series parts are equipped with the GT2 variant of Haswell, which means 20 EUs and slightly improved performance relative to Ivy Bridge models. TDPs are also up 2W, but there are additional features now integrated into the CPU die (e.g. the FIVR, Fully Integrated Voltage Regulator), so in practice power use will typically be the same or better than Ivy Bridge. Intel did not provide any information on pricing for the mobile CPUs, though we would guess it’s similar to what OEMs paid for the previous IVB models (i.e. around $300 for the i7, $200-$225 for i5, and $150 for i3). Moving to the ULV parts, the patterns we’ve seen elsewhere start to break down. While we have maximum Turbo for single-core workloads, the maximum dual-core Turbo Boost is now 300-400MHz lower on Haswell. (Ivy Bridge ULV, if you’re wondering, was generally 200MHz lower.) Part of the reason for this is likely that the iGPU can now use more power, especially on the models equipped with HD Graphics 5000 (GT3). The other change is that vPro, TXT, and VT-d are no longer joined at the hip; only the i7-4650U and i5-4350U get all three features, but most of the models have VT-d support (outside of the i7-4500U and i5-4200U). Finally, TDPs are down 2W relative to Ivy Bridge, which is an interesting state of affairs as all of the other Haswell TDPs are up slightly. We didn’t get a full set of gaming performance numbers from Intel, and 3DMark scores are prone to being heavily optimized, but we do happen to use Tomb Raider and Bioshock Infinite as gaming tests so we have scores for those. Ivy Bridge i7-3517U delivers frame rates of 20 FPS in Tomb Raider and 16.4 FPS in Bioshock Infinite; I don’t know how Intel derives their “Mean Opinion Score” but if it’s on a scale of 0-5 with 5 being “perfectly playable”, I’d give them both a 1 on Ivy Bridge (0 being reserved for platforms that fail to run a game at all). Yes, in theory you can run the games at medium detail, but the results are so choppy as to be unplayable in practice. The 15W Haswell parts improve performance, but they’re still largely handicapped by the TDP constraints. The processor we really want to test is the i7-4650U (or i7-4550U), as both have HD 5000. However, Anand does have an i7-4500U for testing and he measured 17.4 FPS in Bioshock and 24.6 FPS in Tomb Raider, so HD 4400 comes in 13% and 23% faster than the previous generation IVB HD 4000. 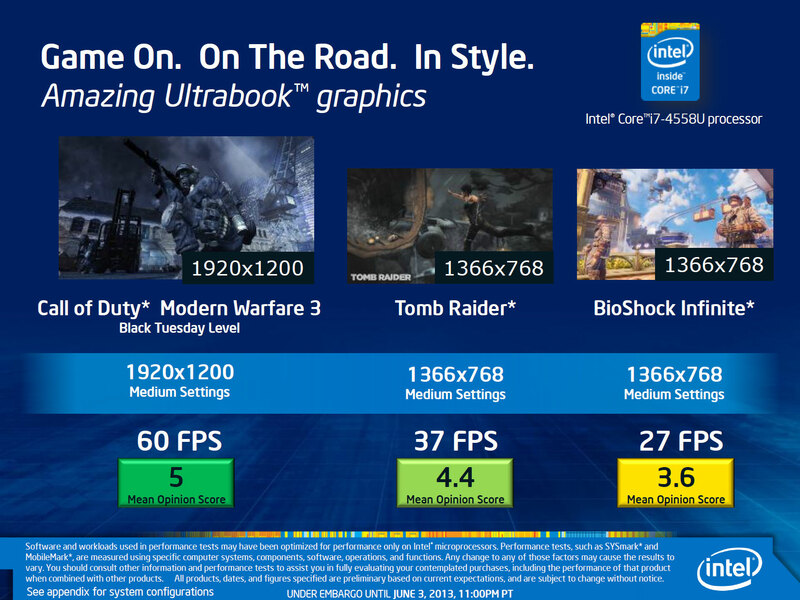 Going by Intel’s numbers, moving to GT3’s 40 EUs and increasing the TDP ceiling to 28W allows the i7-4558U to run Tomb Raider and Bioshock Infinite about 50% faster than the 15W TDP i7-4500U with HD 4400. The question now is how the 15W HD 5000 CPUs compare, but the above 3DMark slide suggests the TDP might be a major bottleneck. Also of note: running gaming benchmarks back-to-back on Ivy Bridge Ultrabooks often results in throttling after the first few runs. Our initial test of Metro: Last Light for example scored 16.3 at the Medium preset, while subsequent runs dropped to 15.4, 13.1, 12.9, and eventually 12.7. A similar sequence of six runs on the Haswell Ultrabook showed no such downward spiral. Wrapping things up, we have the new Y-series “tablet-friendly” processors. Intel did come out with Y-series Ivy Bridge processors, which we’ve included in the above table for reference. The i3-3229Y, i5-3339Y, and i5-3439 had 13W TDP and 7W SDP (Scenario Design Power), while the new Haswell parts have slightly lower 11.5W TDP and 6W SDP ratings. 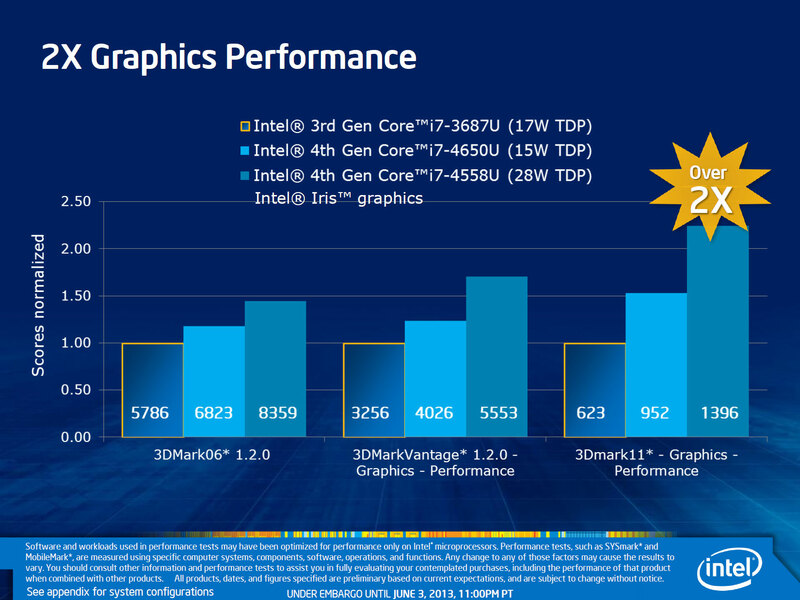 With some of the other changes Intel has made with Haswell (i.e. faster C7 entry/exit), they’re hoping to see more uptake by the OEMs this round. As far as clock speeds go, the new Haswell parts are actually clocked 100MHz lower than their Ivy Bridge counterparts, and we don’t yet have a true replacement for the i5-3439Y. On the GPU side of things, the maximum clock remains at 850MHz but the minimum clock is now 200MHz, which should help improve power use in light/idle workloads. The Y-series is really a prime example of the two directions you can go with a new processor: work to improve performance, or keep performance roughly the same but improve power characteristics. Without a new process technology, Intel doesn’t really have much room to substantially change either aspect, but where we get incremental improvements in CPU performance on the other Haswell chips—and potentially large improvements in GPU performance in some cases—on the Y-series I expect performance to be very close to what we already had with Ivy Bridge, but at lower power use. There are still plenty of Haswell chips for Intel to release—along with the desktop Core i3 variants, we’re also missing desktop, mobile, and ultramobile Pentium and Celeron models. 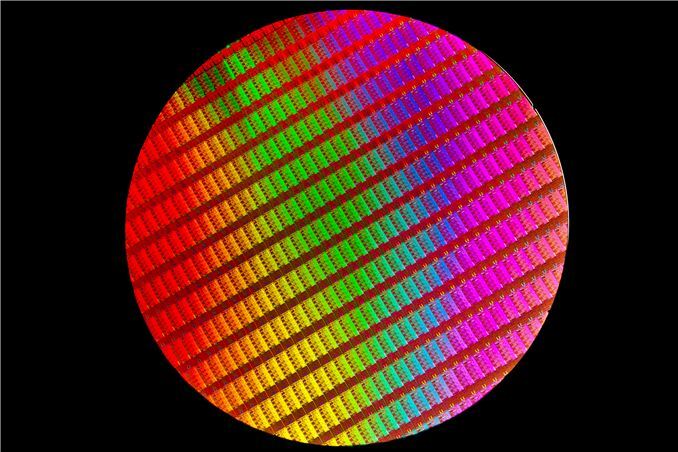 We’ll probably see desktop Core i3 in a few months, while the Pentium and Celeron parts may take a lot longer to show up. Considering the name of the game is targeting various markets and price points, Intel should already have the budget sector largely covered by their existing Ivy Bridge Pentium and Celeron offerings. It would be cool to see a GT3 equipped Core i3 desktop part (the Haswell equivalent of the i3-3225 and similar models), but we’ll have to see if Intel is willing to go that far on a budget processor. I closed all background programs, switched to balanced profile, and unplugged the adapter. The screen is on 60hz. You should watch out for misleading "battery tests" that only test how much time the machine lasts while only playing video. Video playing time != average battery life. Now the U series with gt3 gpu sans expensive cache, is by far the most interesting of the Haswell lineup, and looks like the optimal perf/w - market proposition. It will walk all over jaguar 4c 15w part. This is what Haswell was made for and Haswell at its finest. And it caters both to business market, and us who likes to game a little now and then and have the doe to pay for luxury performance. My IB U on 22nm already seems quite a bit tdp constrained, so the test is interesting. Anyway with broadwell on 14 nm, with added efficiency gain for gpu part it seems they will get there perfectly. At that time the tablet parts can become interesting. As it is, no way will this work in tablet except the usual halo product. Lay that talk to rest, and anyway who cares. The new Atom is what will handle this.